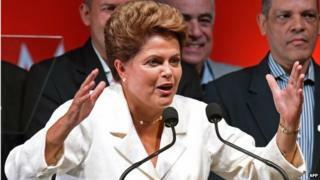 Brazil's President Dilma Rousseff has said investigations into corruption at the state-owned oil company, Petrobras, could change the country forever. She was speaking for the first time since the arrest on Friday of 23 people suspected of corruption and money-laundering. They include top executives of companies which had contracts with Petrobras. President Rousseff chaired the board of Petrobras from 2003 to 2010. President Rousseff said all agreements between Petrobras and a handful of large construction companies which acted as contractors for Petrobras would be investigated. She said the investigation would target individuals rather than Petrobras as a company. Image caption The Petrobras scandal has also spread to MPs of the largest ruling parties, including President Rousseff's Workers Party. The scandal surrounding Petrobras was a sensitive issue for President Rousseff in last month's presidential election.